A beautifully illustrated story about a music-loving dog and his owner. The message of true friendship and relishing joy over jealousy is important for readers of all ages. One of my favorite picture books is now available in a board book! A friendship story with a twist. April is National Poetry Month, and what better way to celebrate than by sharing this sweet, beautiful picture book with a young reader! Poetree is a pitch-perfect tale about finding friendship — and poetry — where you least expect it. White Rose is based on the true story of teenager Sophie Scholl and the White Rose resistance group in World War II Germany. The story is told masterfully in verse by debut author Kip Wilson. While the novel is purely speculative, Samira Ahmed takes the rhetoric floated by politicians today and sets her book in a dystopian near future. It’s a look at what happens when fearsome language gives way to violent actions, but most importantly, it’s about the ones who refuse to fold and choose resistance instead. If you crossed the feminist dystopia of Margaret Atwood with the lush and lyrical prose of Anna Marie McLemore, you might end up with something like We Set the Dark on Fire, a stunningly accomplished debut that kept me turning pages way past my bedtime. 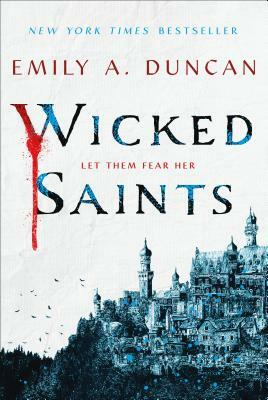 Emily Duncan’s debut novel, Wicked Saints, is a thrilling fantasy (perfect for fans of Leigh Bardugo) and one of 2019’s most highly anticipated debut novels. Check out some of the early buzz below, and if you’re in Nashville, be sure to mark your calendar for April 5, when Emily will be stopping by Parnassus to share and sign her book alongside Christine Lynn Herman, author of The Devouring Gray. Emily will be at Parnassus on Friday, April 5, at 6:30pm! Click here for details. ParnassusNext is the book subscription box for YA lovers. Every member of ParnassusNext receives a first edition hardcover of each month’s selected book, signed by the author. There is no membership fee to join — and no line to stand in for the autograph. Not only will you have one of the best YA books of the month when it comes out, you’ll have it straight from the author’s hands, with an original, authentic signature! Set up a subscription for yourself or buy a gift membership for your favorite YA reader for 3, 6, or 12 months.. Looking for play date ideas? Bring a friend or make a friend at storytime each Saturday at 10:30 a.m. and Thursday at 4 p.m.! Hannah Carmona Dias, author of Dazzling Travis: A Story About Being Confident & Original — April 6, 2 p.m.
Kerry Madden-Lunsford, author of Ernestine’s Milky Way — April 14, 2 p.m.
Ann Patchett and Robin Preiss Glasser, author/illustrator of Lambslide — May 6, 4:30 p.m.